Will mobile tools help turn empathy into action? 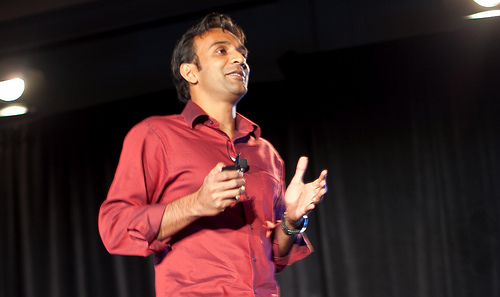 Perhaps the most anticipated keynote at last week’s Where 2.0 conference in California’s Silicon Valley came from D.J. Patil, the former chief scientist of LinkedIn who is now chief product officer of the hot Silicon Valley startup Color, which recently raked in $41 million in venture backing. Patil gave a memorable presentation about how we’re connecting to each other in new ways using social tools. Toward the end of his talk he began pondering how we’re starting to see empathy turned into action through the power of proximity. Color is one of the new breed of social media sharing apps that lets you share images, video and text with the public – and, this is key, not just your friends or social network but with everyone. Every photo or video you share in Color can be seen almost instantly by anyone nearby using the app, so if you’re at an event, your uploads become part of a greater visual story, with lots of points of view. (Here’s a quick video demo.) Color is like a Twitter for images. We’ve known for some time that people are increasingly willing to share social objects online with family, friends and, increasingly, the public at large. (Thank you, Facebook, YouTube and Flickr.) And while the vast majority of this social sharing is done for entertainment purposes, and a small subset revolves around business or commerce, an even smaller centers on social good, causes and social justice. You may have noticed the larger trend taking place in the social causes space over the past few years: People increasingly want to help a specific person, cause or project rather than a general cause or organization. So you see people loaning money to specific entrepreneurs on Kiva, donating to community projects on Jolkona, funding specific public classroom projects on DonorsChoose and helping out specific individuals or causes on give2gether. Can physical location provide added context? Until now, location hasn’t been a major part of this conversation. But perhaps that’s about to change. In his presentation, Patil outlined a vision where physical proximity adds context to a location, leading to an increase in the level of trust and familiarity between participants, whether they’re neighbors, attendees at a wedding or eyewitnesses to an event.